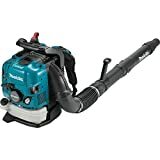 We are trying to determine what the best leaf blower is, and we created this best backpack leaf blower reviews because you will often find you need to make a choice between power and price. The more power you have, the more expensive the blower tends to be. This guide will help you select the best backpack leaf blower you can buy that is powerful enough to get the job done, without breaking the bank. A good rule to follow is that if you need more than an hour to clear your yard, you may want to consider a backpack leaf blower. Continue reading our best backpack leaf blower reviews to find out which one fits you the best. Many backpack models are designed for landscaping professionals. If you are a homeowner you may want to consider other leaf blower options, unless you have a large area to clear or one with thick leaves or debris you need to move. Most backpack leaf blowers are powerful enough to double as snow blowers in the winter time, which can be quite useful. To understand what you need to know to select the best backpack leaf blower it will be helpful to understand what features are most important when selecting a leaf blower. You should select a leaf blower with sufficient ability to sweep and loosen leaves and debris. The tube is the part of the design that has the most control over this. Some tubes just blast air at the ground but are not particularly effective at moving leaves. Airflow is what will determine things such as the velocity of the blower and the volume of material it is designed to blow. You cannot rely solely on either one of these specific specifications because the design of the tube will have a great impact on general performance. A good leaf blower will offer you variable speeds so that you can adjust it to provide optimal power over various conditions. The power settings should be adjustable so you can customize your power. Models with power dials are not as good as models with variable speeds but are better than those that only offer a single constant speed. If you are purchasing a backpack leaf blower it is most likely that you will need to use your blower for extended periods of time. Important features to look for in a harness are wide comfortable shoulder pads and a thick comfortable back strap for added support. Arguably the most important point and no leaf blower review would be complete without mentioning noise level. Leaf blowers can be extremely loud to operate. Even the quietest of leaf blowers may cause disruptions in your neighborhood. Before purchasing one, check to see what the noise regulations are in your area.Some towns and cities have time limits in which blowers can be used, while others do not allow them at all. When using a leaf blower, ear protection is a must. Safety glasses are also important because you will have things flying towards your face. Backpack leaf blowers are ideal when you have a large area you need to clear in a short period of time. You may not need a backpack leaf blower if you have a smaller property or if you only use it occasionally. Smaller electric corded or cordless models can be effective and they are more cost-effective than the larger backpack blowers. If you have to clear around delicate landscaping you will need a blower with a smaller, more maneuverable, tube so you can do different tasks with it. Small, Medium or Large Garden? Powerful enough for wet & dry leaves? Can be used/carried by all family members? This is a lightweight unit that includes a heavy-duty harness suitable for the homeowner or the professional. Its engine is designed to reduce emissions and increase fuel efficiency. This unit was designed for homeowners that have a large yard. A strong 50.2cc 2.1 HP engine with a maximum air speed of up to 180 mph can be found on this unit. The Unit was made in Switzerland and Husqvarna is an old and well-respected company known for producing all kinds of quality outdoor equipment. The 2-stroke X-TORQ engine design is made to give you increased fuel power, better fuel efficiency, and reduced emissions. It is designed to consume 20% less fuel and lower emissions by 60% compared to other 2-stroke engines. 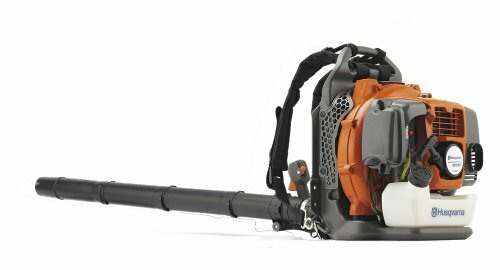 This is a powerful two-cycle midsize backpack blower model offered by Echo. It can produce wind speeds up to 215 mph. It has an engine displacement off 58.2cc. It can move 510 cubic feet of air per minute. It is powerful enough to tackle your biggest jobs. This unit can be useful for landscaping professionals due to its power and comfortable design. It is also a great option for homeowners that want to clear their yards of leaves quickly or those that have a large piece of property they need to cover. This is a powerful leaf blower features variable speeds and outperforms many other models with its 600 cubic feet per minute air output capability.It is much quieter than gas blowers because this model is completely electric.It uses a 5.0 Ah battery that is also compatible with other Echo power products.The blower is capable of producing wind speeds up to 145 MPH. The speed is adjustable on this model and it is up to 8 times quieter than gas models. The battery on this unit can be used with any of the other EGO POWER tools or chargers. 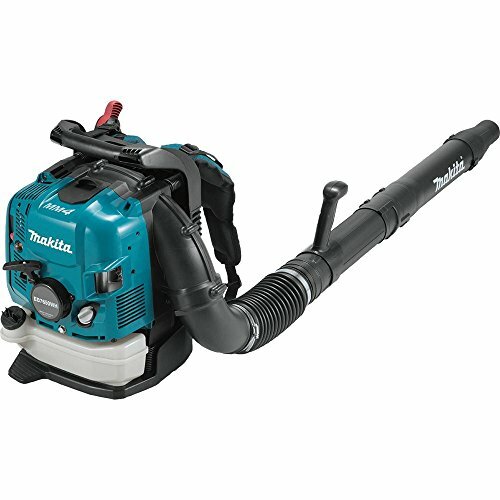 The Makita’s high powered 4-stroke engine is designed for professional landscaping uses. The commercial grade engine is 75.6cc with 3.8 HP engine. It is designed to start easily. The throttle controls are conveniently located near your hip and feature both cruise control and a quick on/off switch. The harness is designed to be adjustable so it can be a comfortable fit for anyone. A large capacity motor is designed to help reduce noise. It can produce maximum air speeds of up to 200 MPH with an air volume output of 670 cubic feet per minute. This powerful 2-cycle engine is designed for the landscaping professional. It features a powerful 2-stroke ultra-low emission, high powered engine. It has a 75.6cc displacement and offers 4.4 HP for the toughest jobs. The maximum airspeed is 206 MPH and it is capable of producing 908 cubic feet per minute of airflow. A cooled backpack makes this unit comfortable for all day use. Throttle controls are mounted on the tube for convenience and comfort. When choosing the right leaf blower for you, you need to consider comfort and reliability and ensure the unit you select is light enough that you will be able to use it comfortably for extended periods of time. 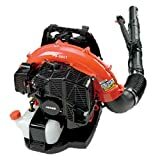 Noise may be a consideration where you live so that is something you should think about when determining which kind of leaf blower you wish to purchase. 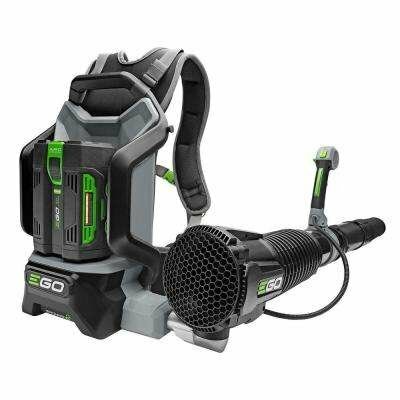 Best backpack leaf blower reviews recommend the Echo PB-580T for homeowners. It beats out the EGO POWER because the EGO’s operation time is limited by the battery life of the unit; extra batteries may be required to complete a large job. The Husqvarna 350 BT was a close contender for best backpack leaf blower, but the Echo beat it out due to its increased power output. Either model would give you great performance. The Echo is more powerful than the Husqvarna, but the Husqvarna has a more efficient engine design than the Echo. The Makita and the RedMax are both great leaf blowers, but more suitable for the professional landscapers, rather than homeowners. Both models are expensive and most homeowners do not need leaf blowers designed to be used on a daily basis for extended periods of time. The Echo PB-580T is a great blower that will not break the bank, but give you all the power you need to complete even the toughest jobs around the house. This is why we selected it as the best backpack leaf blower for the consumer homeowner. I hope you found our best backpack leaf blower reviews useful and we hope to see you again.